The West Reserve consists of 610.0 (+/-) total acres of which 434.74 (+/-) acres are currently enrolled in the Conservation Reserve Program (“CRP”) providing excellent wildlife habitat and annual income. The land is located in Jefferson County, Arkansas just outside of the city limits of Pine Bluff , Arkansas (the south side of the I-540 by-pass loop). The property is bisected by Arkansas Highway 63, which creates two (2) tracts. 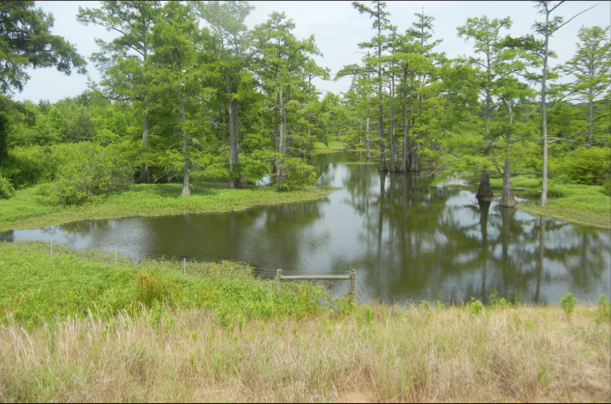 The property provides a diversified habitat of mature hardwood and pine timber, young fields, thickets, food plots, bayou and sloughs/wetlands. The land offers an excellent timber investment with 90 (+/-) acres in mature, uneven age, mixed-stand of pine and hardwoods, coupled with the 434.74 (+/-) acres in young hardwoods (CRP) provides a stable, annual income. The property has been primarily developed and intensively managed for hunting white-tailed deer, with several deer over 160 inches having been harvested. Along with the many food plots within the property boundary, agricultural lands border the property on the east providing an excellent nutrient source for deer. There is an additional 122 (+/-) acres of leased lands bordering the south side of the property, providing additional deer habitat. Several shooting lanes and feeder stations have been established on the property (deer stands and feeders do not convey with the sale of the property). The quality deer hunting is expected to continue to improve commensurate with the maturity of the CRP habitat and continuation of the management practices in place. Duck hunting opportunities can be found on the western areas of the property and along Imbeau Bayou, which runs through both the west and east tracts. Turkey have been reported to frequent the land from time to time and dove and small-game hunting is abundant in various areas of the property. Fishing for bass, crappie, bream and catfish is available via Imbeau Bayou and the two (2) ponds. There is a bar pit on the property (10-12’ deep), one (1) well located on the east par- cel, and a re-lift site on Imbeau Bayou on the west side of the property. The property is bordered on the north by the I-530 loop and is bisected by Arkansas Highway 63. The west tract of the property can be accessed via an easement off of Olive Street. The east tract is accessed through a cabled road off of Wilbur West Street (also known as Ohio Street). The property is offerd for sale for $1,100,000.00 and the Seller will consider selling the tracts individually. Any questions concerning this offering or to schedule a property tour should be directed to Gardner Lile (mobile: 501-658-9275) or Gar Lile (mobile: 501-920-7015 | office: 501-374-3411) of Lile Real Estate, Inc.